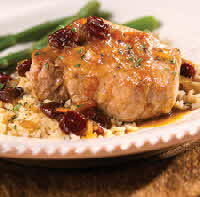 Cherries add flavor to pork chops. Heat oil in a large skillet on high heat. Add pork shops; brown well, about 3 minutes per side. Remove to plate. Add onions to skillet; cook until tender, 3 to 5 minutes. Add chicken broth, dried cherries, orange marmalade, vinegar and red pepper flakes. Bring to a boil; boil rapidly on medium heat until broth is reduced by half. Add pork chops to pan to heat through, 5 to 6 minutes. (Cook pork chops longer on lower heat, if pork chops are very thick or if they have a bone in them.) Internal temperature of the pork should be about 160 degrees. Add chicken broth or water, if needed. Serve pork chops with cherry sauce spooned over them. Nutrition Facts per serving: 444 cal., 22 g total fat (4 g sat. fat), 36 g carbo., 67 mg chol., 26 g pro., 2 g fiber, 628 mg sodium. Daily RDA values: 25% vit. A, 8% vit. C, 4% calcium, 10% iron.